Sponsor a Seasonal Food Drive! Any season is a GREAT time to sponsor a food drive. Demand is always high at the pantry while food drives tend to drop off. We are always looking for volunteers to organize donation events of needed goods! Recently, the members of Seneca Creek Community Church collected 200 bags of donated food from their food drive to provide for area residents. They gave 100 bags to Gaithersburg HELP and another 100 bags to Germantown HELP. Volunteers from Gaithersburg HELP transported their donation from the church to the Gaithersburg HELP pantry for distribution to families in need. 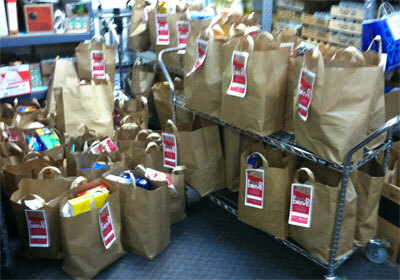 Thanks to kind and generous supporters, dozens of families will benefit from this donated food. Remember students can gain those much needed SSL hours for organizing, collecting and delivering a food drive! Start today and check out How To Hold a Food Drive.